1:00 PM - 2:30 PM Welcome & Opening Keynote - Mark Okerstrom, President and CEO, Expedia Group, Inc.
Head of travel giant, Expedia Group Inc., Mark Okerstrom, will share his views on the travel industry – the trends, the challenges and the opportunities ahead. He will discuss the direction he is taking Expedia Group to stay ahead of the curve in today’s extremely competitive travel industry environment. The keynote will be followed by a conversation with Destination BC CEO, Marsha Walden, to further explore Mark’s strategies and views on the travel industry. Mark Okerstrom, Expedia Group, Inc. Returning to TIC for the third year, go2HR’s Winning Pitch is a competition where post-secondary students pitch business plans to develop a local tourism activity. This year, student teams are asked to develop a new product or service that supports the development of accessible tourism opportunities in their region. Join a panel of tourism leaders as rising stars of BC’s tourism industry from Kootenay Rockies, Thompson Okanagan, Vancouver, Coast & Mountains, and Vancouver Island regions pitch their business ideas. Who will have the winning pitch? As part of the live audience, your vote for your favourite business pitch will contribute to the overall score and help us pick the ultimate winner! Join us at Science World for the kick off social event of the 2019 conference, sponsored by Destination BC. In addition to great food and drink, all delegates are invited by Destination BC to a free industry screening of the new IMAX film, Great Bear Rainforest, scored by Hans Zimmer and narrated by BC’s own Ryan Reynolds. Presented by Seaspan and MacGillivray Freeman Films in association with Destination BC, the film captures spectacular footage of the stunning wildlife and environment in this magical corner of British Columbia. Shuttles will be provided between the JW Marriott and Science World. 7:30 AM - 9:30 AM Breakfast & Keynote Presentation - Tourism: can it be too good and yet not good enough? Ask the average person to think of Travel & Tourism and their face will light up in memory of their last time away. At least we hope it will. In a growing number of places across the world where tourism is too good and too popular, growth and under management of tourism can bring challenges to the balance of life for the residents, crowd the infrastructure in a destination or stress the natural and cultural resources. The smiles may not be as broad as we would like them to be. As a sector that is built on these smiles and on the promises of experiences to come, this is a challenge that we, as industry players, both cannot ignore and need to have a hand in addressing. And, as we look to the trends for future Travel & Tourism growth, this session will discuss how the industry needs to be part of the solutions that will guide collective action. How do we achieve the balance between where a destination is too popular and where a place just wishes they could even be considered? If you’re uncertain about your business prospects and the economy right now, you’re not alone. Despite leading growth in Canada and near historic unemployment, there are signs that BC’s economy is softening. Throw in a federal election (and Alberta election), strained relations with China and other factors, it’s easy to wonder about what comes next. Join BC’s business experts for a discussion on what lies ahead for the province, and how these and other issues will impact BC’s visitor economy. This session will include research results from the BC Chamber’s Collective Perspective annual economic pulse-check, the BC Business Council’s economic outlook, and of course deep insight from the Mustel Group. As the population continues to age, the economic impact this dramatic demographic shift is having on tourism continues to be felt. An ageing workforce, older clientele, and shifting market segments all bring with them a common need for increased meaningful access for people with disabilities. Nearly 50% of Canadian adults have or have experienced a permanent or temporary disability or live with someone who has. Recognizing the changing needs of customers and employees is the key to staying viable in a world where upwards of 40% of the global population will be directly affected by access to the built environment—in less than 20 years. The Rick Hansen Foundation Accessibility Certification™ (RHFAC) program is the first program of its kind to create a nationally consistent universal rating system that measures meaningful access in the built environment from the perspective of people with mobility, vision, and hearing disabilities and challenges. The program helps businesses take advantage of the economic opportunities created by responding to the changing needs of consumers over the longer-term, as well as helping businesses prepare for the coming national legislation on accessibility: Bill C81, the Accessible Canada Act. Brad McCannell, Vice President of Access and Inclusion for the Rick Hansen Foundation and 30-year veteran of developing practical solutions to complicated access issues, will deliver a 45-minute presentation followed by a Q & A session. The presentation will address the realities of developing meaningful access and recognizing inclusion issues as economic opportunities. 11:30 AM - 12:30 PM Concurrent Session A-2 A Rising Tide Lifts All Boats: What are the opportunities of working with Indigenous Communities? Indigenous Tourism BC will host a workshop highlighting how both non-Indigenous and Indigenous businesses and communities can thrive when collaborating and partnering together. BC is the most diverse province for Indigenous cultures in Canada. With 203 different First Nations in BC it is important to understand the opportunities that exist when working in partnership with Indigenous communities. The workshop will provide insights, tools and scenarios for a deeper understanding of working with your local First Nation to provide maximum impact and mutual benefits. As social media platforms evolve, BC tourism organizations need to adapt their social media strategies. Join us for a practical session on what’s new with platforms like Facebook, Instagram and YouTube, and what these changes mean for tourism marketers at DMOs, attractions and tour operators. Hear from Tourism Vancouver Island on how they partner with local stakeholders and Destination BC to leverage images shared on social media to collectively reach and engage visitors. The business of tourism has recently taken a blow. Over-crowding of tourist sites and cities, the impact of Airbnb on local communities, effluents from cruise ships, negative tourism coverage on the cover of the Economist and Time Magazine–tourism’s ills have gone from niche issue to mainstream in just a few short years. Join Greg Klassen and Deirdre Campbell for a rapid fire recap of some of the defining moments, the aha moments and the commitments from the second annual IMPACT Sustainability Travel and Tourism Conference that wapped up last month in Victoria. This keynote presentation will focus on the philosophies, strategies, tactics, and results of the Thompson Okanagan Region’s pursuit of being a world leader in Sustainable Responsible Tourism. Tanya will explore the many forces impacting our economy and our workplaces today, and why gender balance is not only a moral imperative, but also a critical business driver for successful organizations. Gone are the days when you posted a job opening and applicants flocked to apply. Today, you may be following the same hiring routine but you are not seeing results. Savvy employers understand that the paradigm has shifted – it is now an employees’ market – and with it the way you approach recruitment and retention. Last year at TIC you learned about building your brand as an employer of choice. One of the critical components of a successful employer brand is the management of your employees’ experience. What are you doing to set yourself apart from others who are also vying for the attention of job applicants? How should you shift your way of thinking to address the changing needs of employees? Join go2HR and a panel of distinguished employers, who have dared to try something different, and learn how you can implement some of these approaches in your business. Josh Vanderheide, Fieldhouse Brewing Co.
We want sustainable tourism growth in BC and BC’s appeal is our natural places, wilderness and wildlife. Once you open the door to more visitors, there is a threat of losing what attracts so many visitors. How do we balance the increase in demand for visitation with the interests and needs of many players and perspectives? A expert panel will highlight case studies, social media’s role, considerations and what you can do now to take action towards managing growth in your destination. There will be lots of time in the workshop for questions and answers, as well as interactive group discussion and input. Susan Rybar, Vardo Creative Inc.
2:15 PM - 3:30 PM Concurrent Session B-3 Social Strategy: Where do influencers fit into the marketing mix? In our quickly changing media landscape, word-of-mouth referrals and recommendations are the most powerful marketing tools in the travel industry. 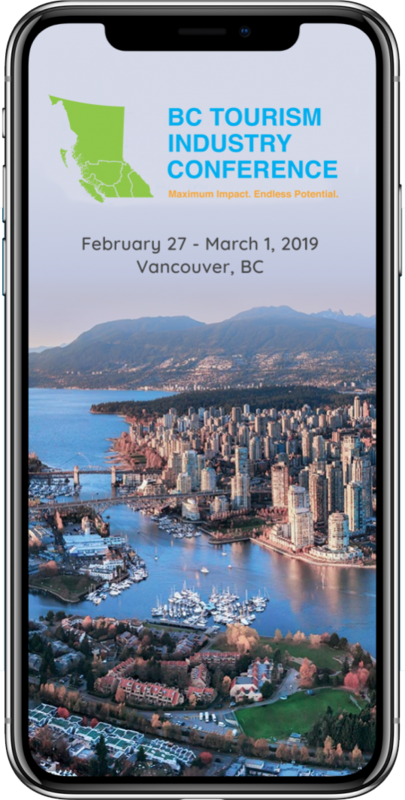 Josie Heisig will share Destination British Columbia’s new strategic approach to working with social media influencers and brand ambassadors. In this session, participants will also discover best practices and learn how to evaluate opportunities. 4:00 PM - 5:15 PM Concurrent Session C-1 Local Government and Tourism: working together on advancing destination development. Local governments shape our communities in British Columbia through policy, investment and community planning. Whether you are a tourism operator in a rural area or a Destination Management Organization in a larger urban centre, local governments are responding to your community’s needs and planning for its future. Destination British Columbia along with our partners, have developed comprehensive destination development strategies, for many planning areas across the Province. Working with local governments to implement priorities within the destination development strategies will be one of the key drivers to our collective success. Join us for an exploratory session on local government engagement and a look at successful examples of advancing destination development priorities through working with local government. Consumers have higher expectations of business than they have in the past. They expect more than excellent customer service. Today’s savvy customer expects businesses to genuinely care for the environment and the wellbeing of society, protect consumer privacy, treat their employees well, and support the local communities and gender-equality. The Gustavson School of Business is concerned about responsible management which is the idea that businesses can benefit from being accountable to communities and society, as well as to investors. Every year, the school conducts the Gustavson Brand Trust Index (GBTI) to understand nearly 6,500 Canadian consumers’ perceptions of trust for 300 brands across 26 consumer categories. In the light of striking findings on Canadian consumer trust in brands from the GBTI study, Dr. David Dunne, Professor; Director MBA Programs, Gustavson School of Business will have a candid discussion about how trust impacts a company’s success, no matter how large or small their enterprise. We anticipate that this conversation will lead to creative thinking to develop innovative ideas and actionable solutions for environmental, economic, and social challenges in the tourism industry. When it comes to website design, sometimes you get pressured to keep up with all the new design trends, bells, and whistles. When design focuses more on aesthetics than usability your visitors and your leads suffer the most. Developing a culture of testing within your DMO will not only help you create a better experience for your visitors but will make you look like a rockstar to your board or boss. Learn how to gather and understand data about your website to see which elements work best, build a solid testing strategy to make your website achieve better results, and implement the changes that matter most. “Powering the Visitor Economy” – David Goldstein, President and CEO of Destination Canada will speak about how Destination Canada supports a thriving Visitor Economy. With a Team Canada approach, data-driven marketing and future-focused strategy, Destination Canada is well-positioned to support Canada’s largest service export from Coast to Coast to Coast. Learn about the Google tools that can help you understand customer behavior with your online presence. We’ll show you how you can use this information to make informed decisions about your ongoing online marketing strategy. This workshop is part of the Get Your Business Online with Google program, and is brought to you by Destination BC as part of its continued focus on growing the tourism industry’s digital readiness capabilities. Business events (meetings, conventions, exhibitions, incentive and sport) and tourism are globally interconnected industries that thrive through collaboration. Tens of thousands of suppliers and destinations compete for the attention of customers daily. Working with like-minded entities enables organizations to leverage resources, knowledge and opportunities that they would not be able to access on their own. During this session, a panel of speakers will discuss how their organizations have helped BC, Canada and the City of Seattle succeed through partnerships. The speakers will use case studies to share key learnings that will be relevant to anyone interested in developing long-term collaboration. The MIND Partnership has connected Tourism Vancouver with local universities to generate meetings; the Pacific Asia Travel Association has facilitated BC organizations, including Capilano University, to align strategic interests in the Asia Pacific region; and, the Seattle Sports Commission uses its extensive network of partnerships and business leaders to create opportunities for the city and region. With so many international and Canadian consumers interested in cannabis tourism, BC has a unique opportunity to become a leader in world-class cannabis experiences and to set the international gold standard for cannabis tourism. To succeed, BC’s tourism businesses need to learn how to operate and innovate amid a highly regulated environment. Our panel of industry experts will explore recent market research and consumer insights on cannabis tourism, the impact of current cannabis regulation and policies, and offer helpful insights on how you can position your business in this emerging industry. Brian Keating is an award winning conservationist, educator, naturalist and wildLife expert. He is also a pilot, a naturalist, scuba diver, and mountaineer. His presentations are often considered the highlight of many conferences and events, and have been described as eloquent, passionate and humourous. Brian will share with us his travels into some of the planet’s most spectacular wilderness – both abroad, and in our Canadian backyard. This presentation is designed to inspire and enthuse, offering hope for a better tomorrow. You can have the the entire conference at your finger tips when you download the app. Click here to download. Looking for the old-fashioned Conference Agenda?